As an added bonus if you purchased the GeoMaps Add-on you can also add location based search functionality in the Advanced Search Joomla Module / WordPress Widget or directly through the GeoMaps Joomla Module / WordPress Widget. Simple Search is a single input search option that appears by default on top of directory and category pages. It's the most obvious way for a site visitor to perform a search when they are browsing your site. You can find settings for this type of search in the Configuration / Search tab to toggle it off or change the way results are filtered based on the current page. Next to the Simple Search you'll see a link to the advanced search page. This page let's users perform a more refined search by first narrowing down the Listing Type, if your site has more than one type, and then making choices or filling out inputs for the Custom Fields. You can choose which fields appear in the search page in the Fields Manager. We recommend you take some time to do this so your search forms are not overly complicated and include just the necessary inputs that will add value to visitors. Our favorite and most powerful search feature is the Advanced Search Joomla Module / WordPress Widget. That's because you can place it anywhere on your site, including front and center on your home page. It's fully customizable so you can make it very simple or as refined as you want by adding Custom Fields. And this can be done directly via settings without having to modify any theme files. It has live search functionality so results appear as users type and make selections. And finally, with the GeoMaps Add-on it transforms into a powerful store locator or place finder. Read more about creating custom Advanced Search forms. Advanced Filtering is a different take on the Advanced Search module/widget, giving you the ability to create a filter system similar to what is you see on sites like Amazon, eBay, and TripAdvisor. The Advanced Filtering Joomla module and WordPress widgets can be very easily customized through the use of shortcodes to create your custom filtering form. The shortcodes offer many different configuration options via different attributes. Make sure you check the Advanced Filtering Documentation to get started. 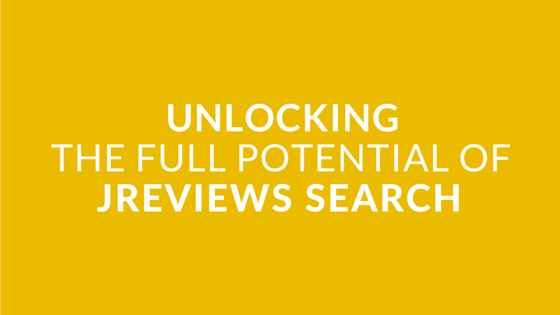 We covered Click2search in post Intro #5 - Understing and Using the JReviews SEO features. This feature which can be enabled individually for each Custom Field allows site visitors to filter listings based on a single field. So if you are looking at an Italian restaurant you can quickly find other Italian restaurants via Click2search. Or if you are looking at a book by a certain author you can quickly find other books by the same author. Click2search becomes even more powerful when combined with the Fields Joomla Module / WordPress Widget to create a virtual category system that can also be used for browsing your site and can even go several levels deep if you use field relations. To put this in context let's say you setup your site using fields for State and City like we did in our demo. You share those fields across multiple categories and listing types, but there's no simple way to navigate the site based on category and location. The Fields Module / Widget solves that problem. Read more about using Custom Fields as virtual categories.